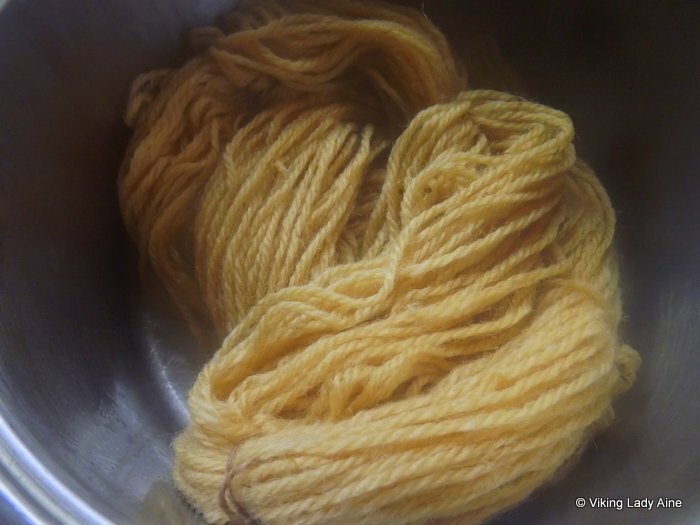 So you might remember that I blogged about dyeing with the skins of white onions back in February; they have the gold/yellow papery skins. 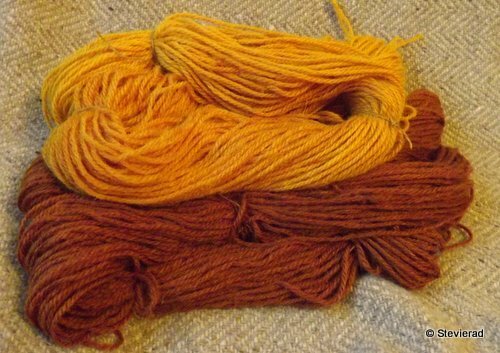 I had added a copper mordant to the dye pot at the end in an attempt to create a deeper, richer colour. 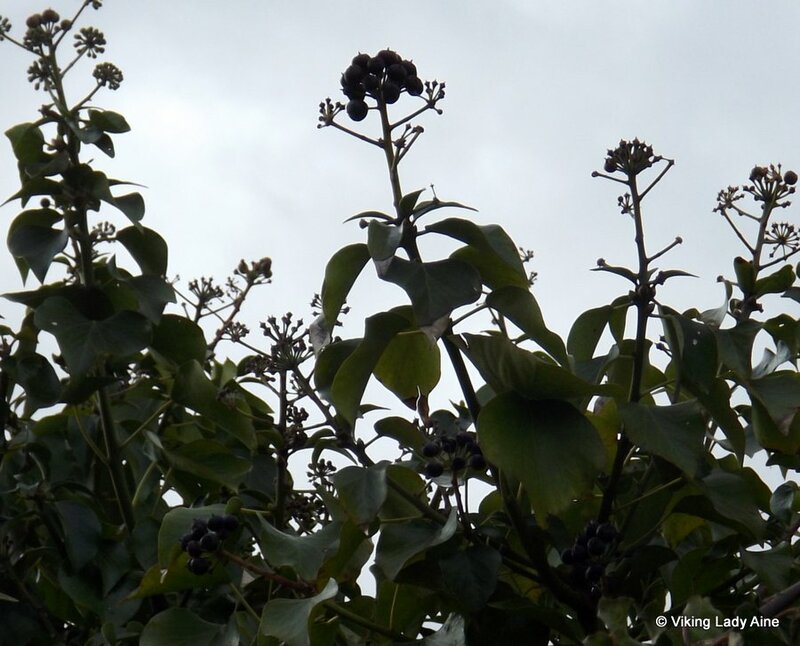 The photo below shows the result from then. 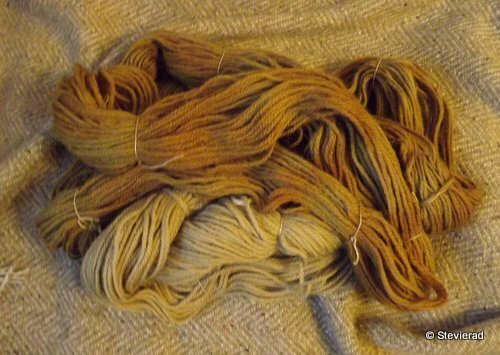 The yellow colour was from dyeing the wool for one hour in an onion dye stuff; the deeper brown colour was created after adding the copper mordant. After posting it, a reader commented that if I had used red onion skins, I would have gotten the same results. Nothing like a bit of experimentation…….. I tried to keep the red onion dye prep as close to the original. I used the same method I had used for the plain onion skins. 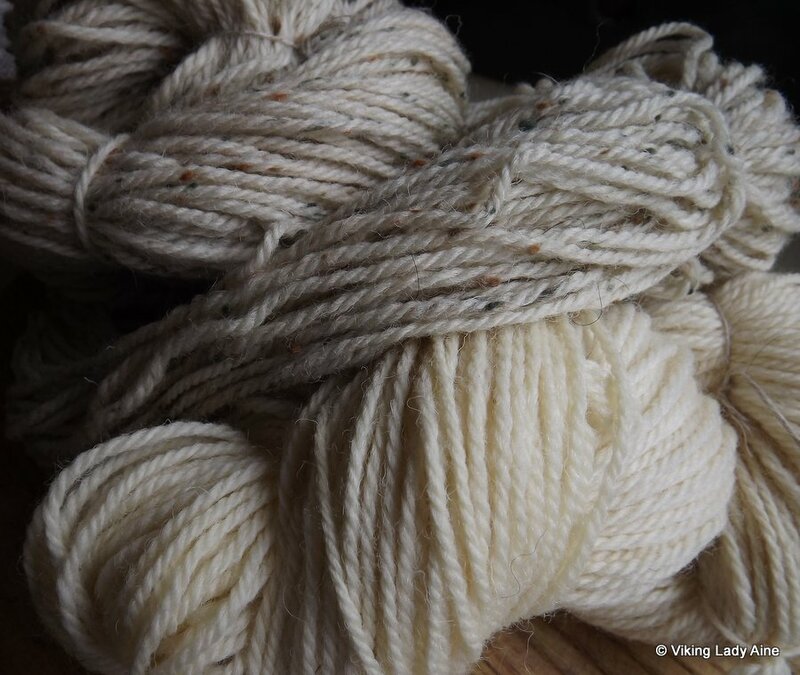 I use one third the weight of the wool in skins; 33g of skins per 100g of wool. I also used the same wool type and water source. 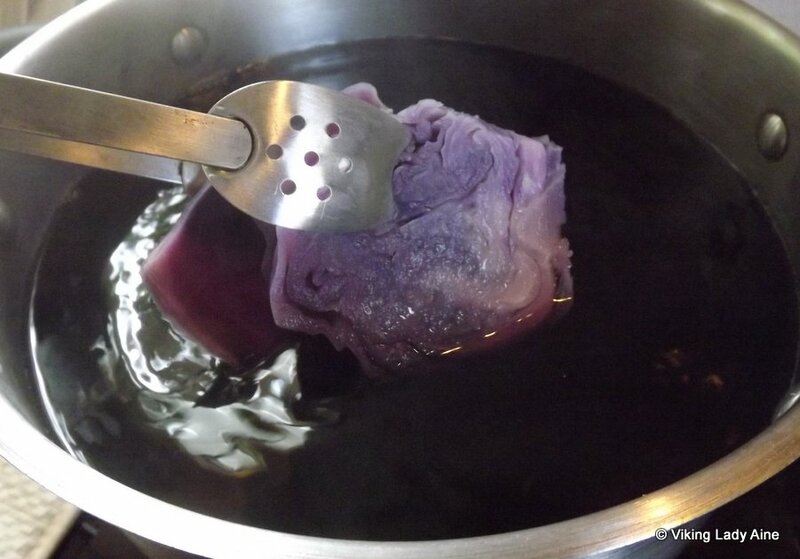 I boiled the skins in rain water to get the dye stuff. After simmering for an hour, I drained the water off the skins and used this as my dye. I have to say that it looked quite promising. After simmering for an hour I got the following results. They are really lovely colours. The question was did the red onions give the same colour as the plain onions with a copper mordant? To me the answer has to be no; at least not in this case. The copper mordant seemed to have dyed the wool a deeper shade of brown, whereas the red onion skins gave a deeper gold yellow. 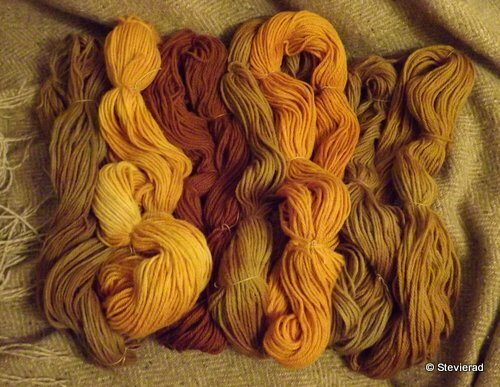 But to be honest, both dyeing attempts gave beautiful colours…. Now to start saving skins all over again……. 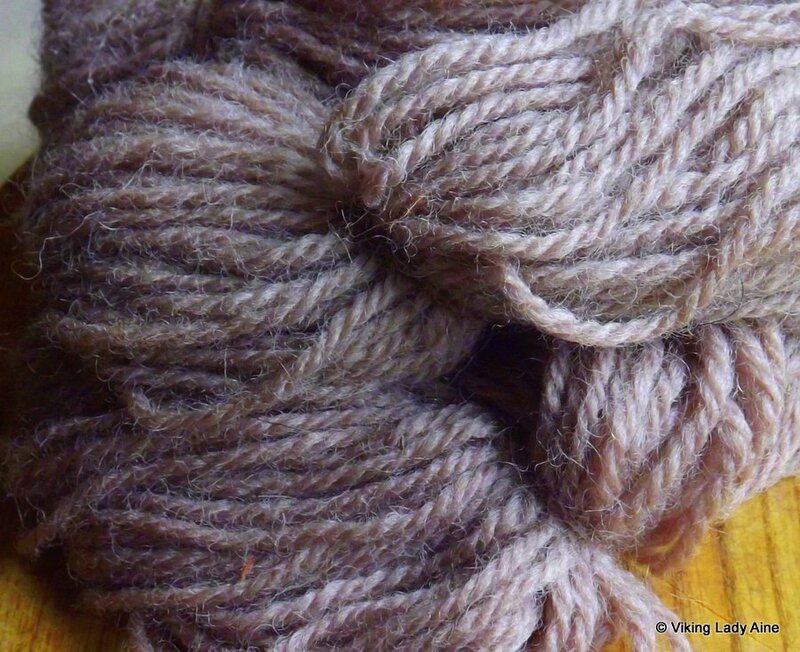 Posted on June 8, 2013 July 14, 2013 Categories Dying, Wool CraftTags Copper, craft, Dye, Hand dyeing, instructions, Mordant, natural, natural dye recipes, natural dyes, onions, Red Onions, Viking, Wool, wool-craft, Yarn4 Comments on Red Onions to dye……..
Ivy; there’s tons of it growing over my yard wall, and Bob had asked what colours we would get with the leaves and berries. So I decided to give it a go. I had tried this a couple of months ago without the berries. But this time I wanted to include them so I needed to wait until they had ripened. I hadn’t taken any photos last time, but the results were much the same. 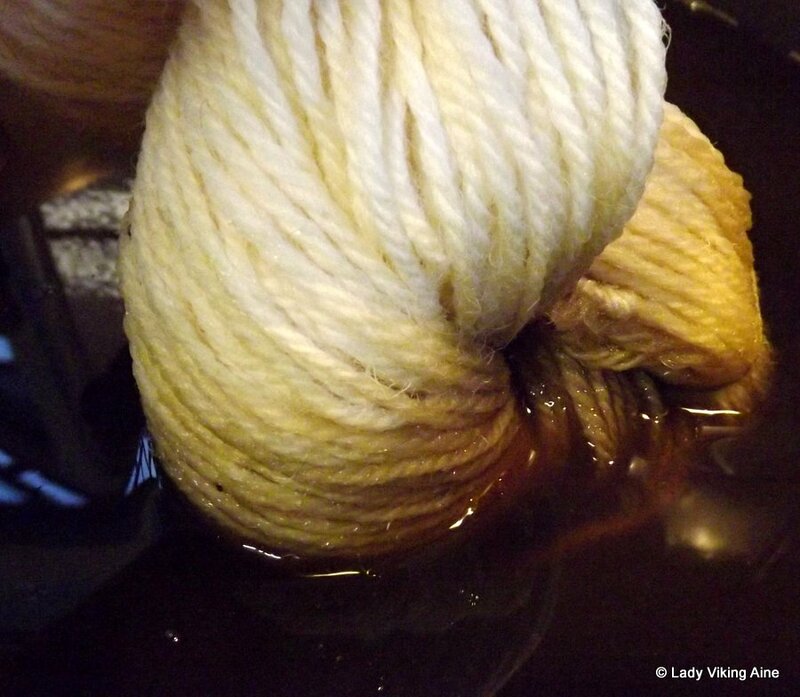 I used the same procedure as with the other dyestuffs; twice the weight of dye material to wool. 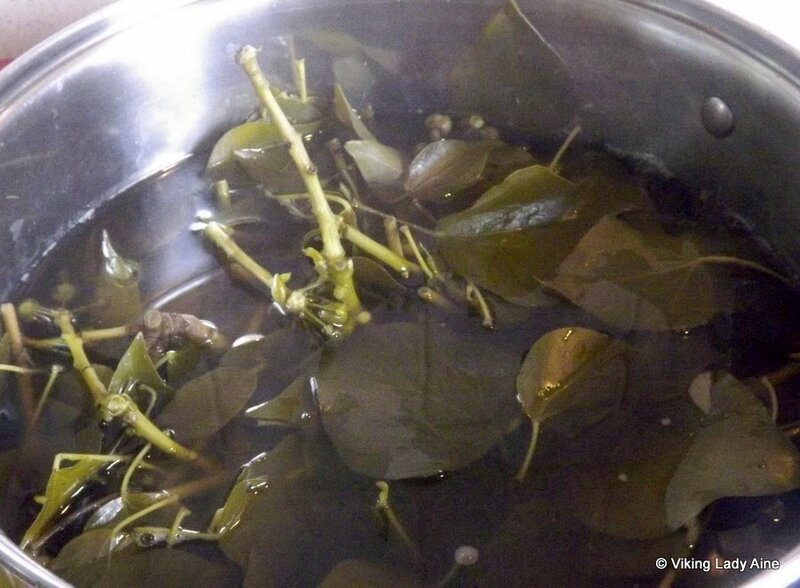 Also I let the twigs, leaves and berries soak for a week to get the maximum amount of dye in the pot. As usual I had pre-mordanted the wool with Alum. 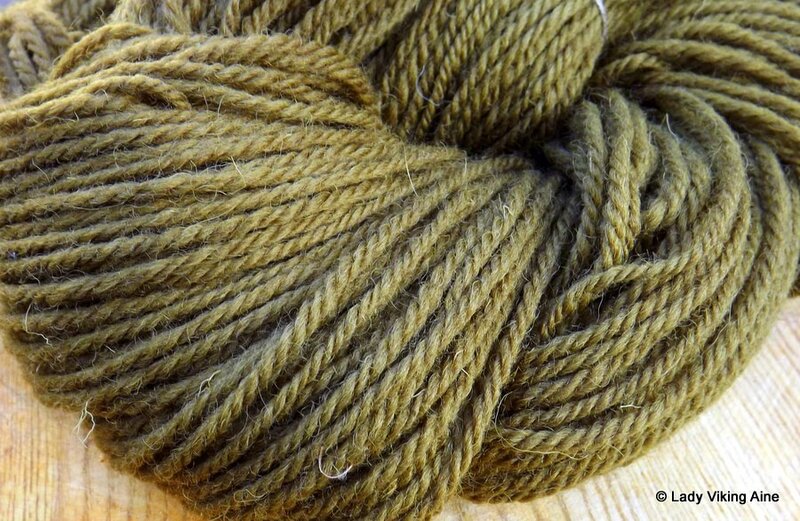 I wanted to dye 300g of Aran weight wool. When I added the wool initially there was no significant change to the colour. After an hour, there was a definite change in colour, but not the green I had hoped for. Instead I got a yellow; nice but not what I had wanted. So I added copper sulphate to the pot (2 teaspoons per 100g wool), and continued to simmer for a further hour. This gave a better result. It’s green, but still not the green I had wanted. 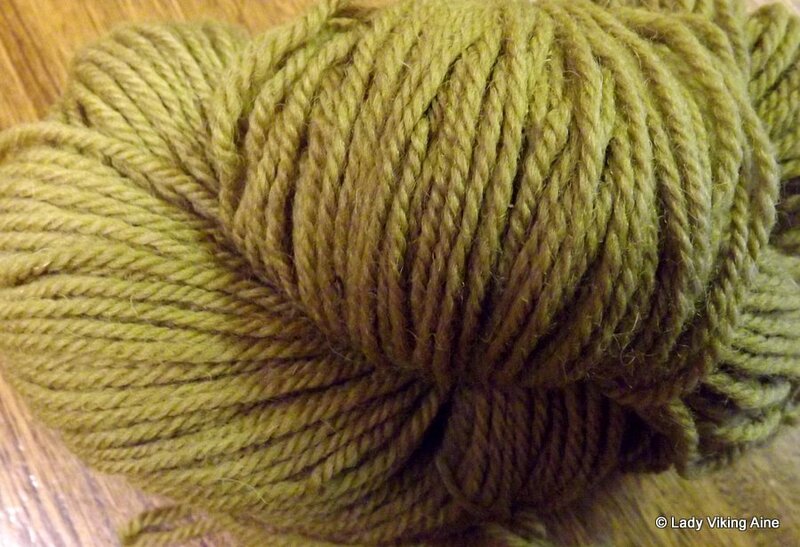 In real life it’s a slightly darker; below is a photo I took in natural daylight the following day, after the wool had dried. 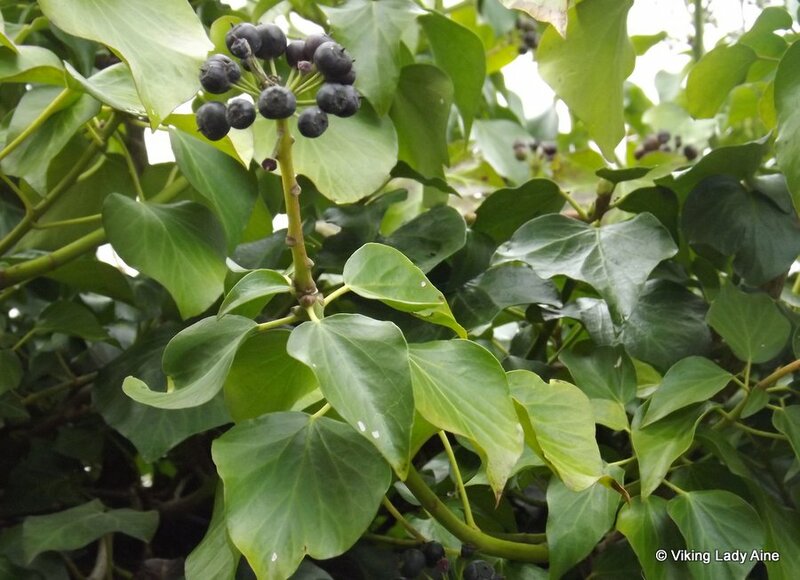 Last year using the same ivy plant I got a great green that I used in a hat for Bob. This was a different type of wool, and a different year, so that may account for the difference. 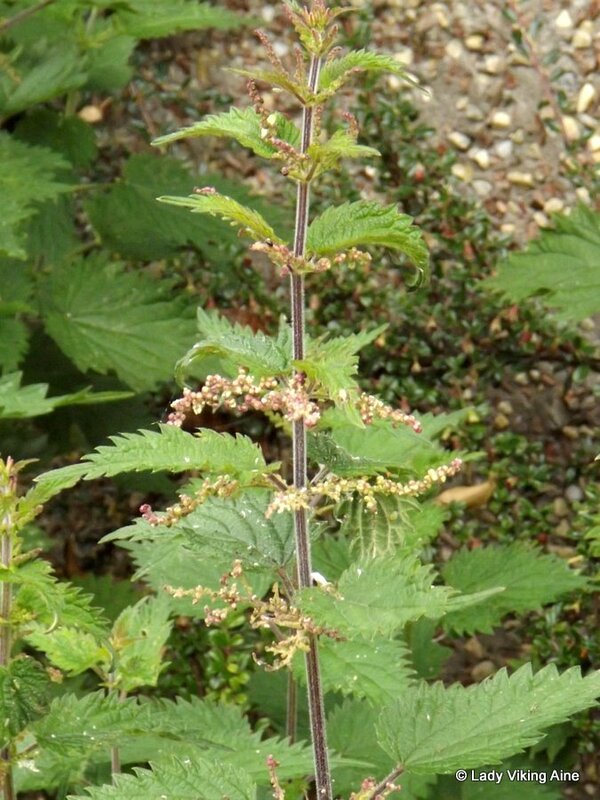 My little nettle patch is growing, so I plan on trying those for a green…….. So it’s spring, and like all good 21st century vikings I recently did a quick spring clean; well actually I had to defrost my freezer as it had become very badly iced over! Anyway, while cleaning out the drawers I came across a box of frozen blackberries. 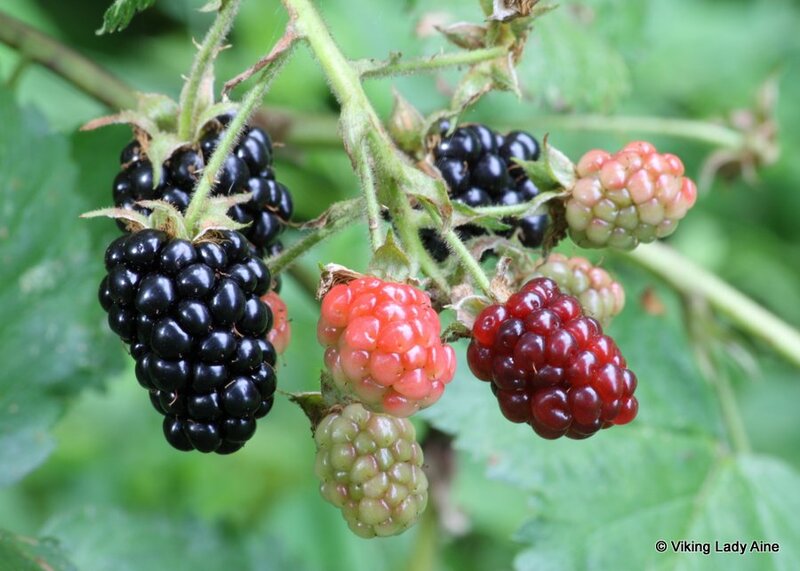 I had bought them with the intention of making a Blackberry Crumble but must have forgotten them. 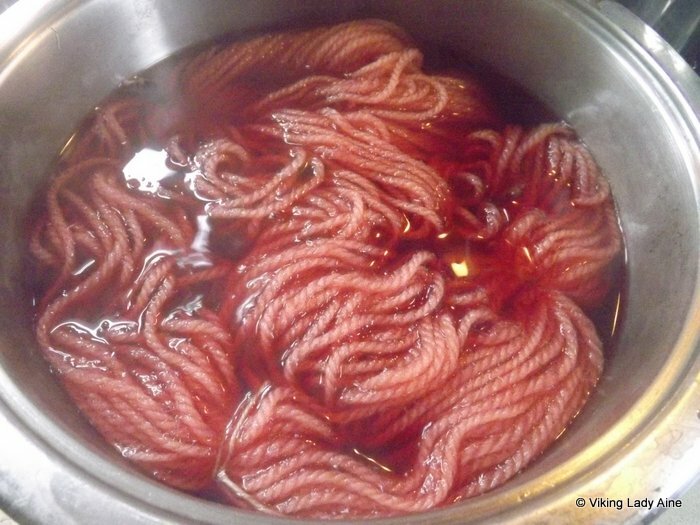 They had passed their sell-by date by quite a long time, and so with the principle of waste not want not, I decided to use them to dye some wool. At the same time I could justify using another fruit as a dye stuff. I had previously mordanted some wool with Alum. 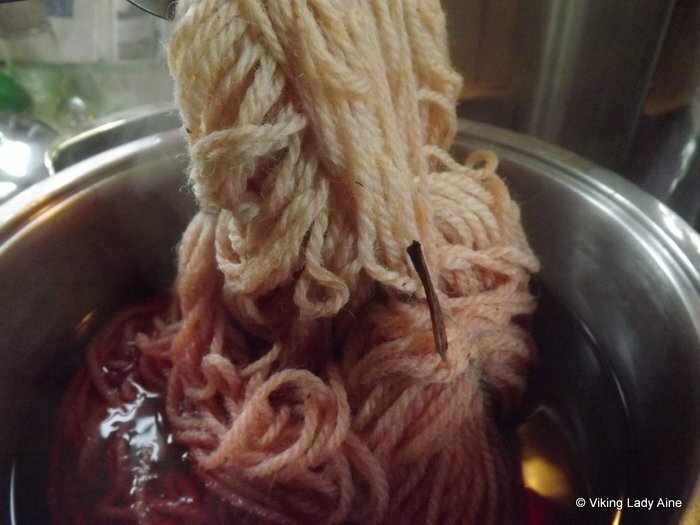 As in the previous dye experiments, I was so hopeful when I added the wool to the dye-bath; it looked like I was going to get a beautiful rose pink. But as in the previous experiments, what you initially appear to get is not always what you end up with . This time we got a blue/gray (the photos don’t show the colour exactly)! So there we are; another dye experiment completed. 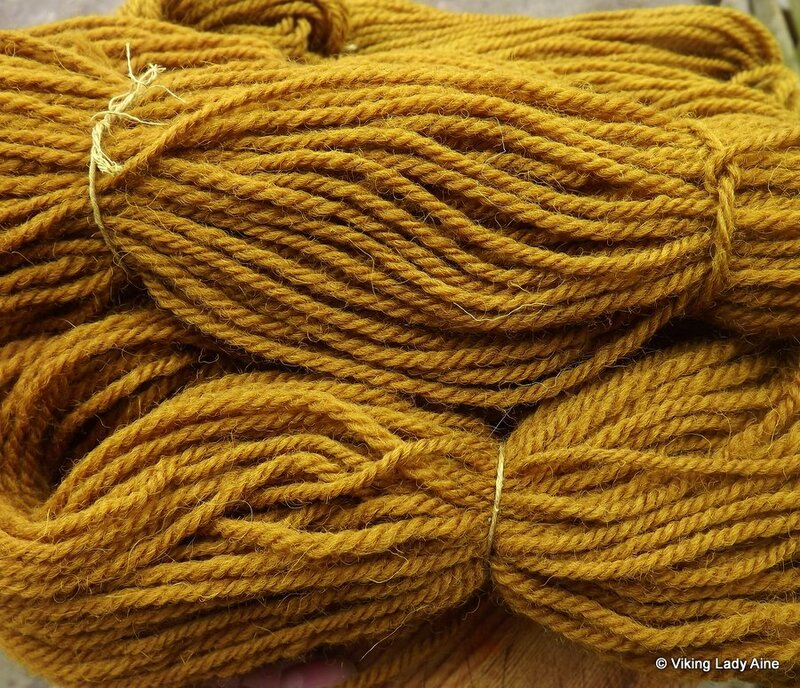 Posted on April 10, 2013 July 14, 2013 Categories Dying, Wool CraftTags Alum, Blackberries, Dye, Hand dyeing, Mordant, natural, natural dye recipes, natural dyes, Wool, wool-craft, Yarn5 Comments on Blackberries………… to dye for! This dyeing lark can becoming a bit addictive!! 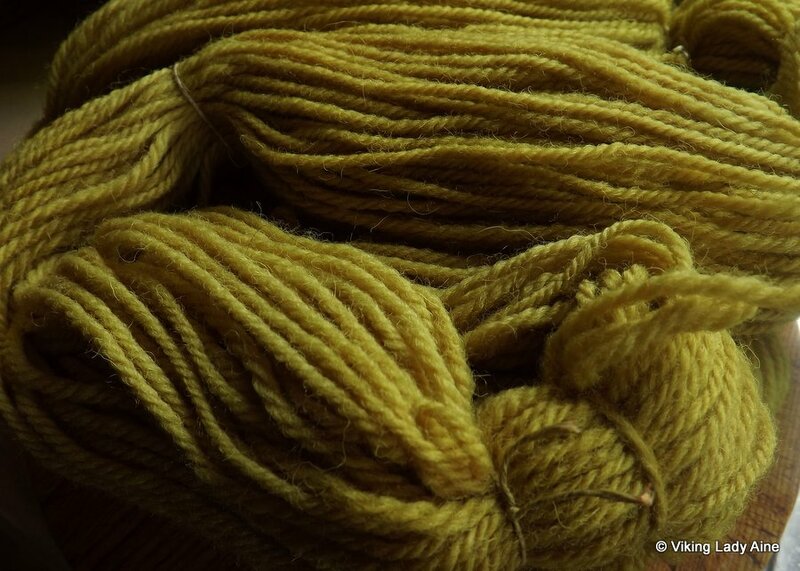 Since I started I find myself looking at plants in a whole new light; where before I thought about texture, colour and where the plant would fit in my garden, I now find myself looking at a plant and wondering what colour would it give to my wool? This now also seems to apply to the vegetables I cook! After my beetroot experiments. someone mentioned red cabbage as another plant that gives unexpected results. Naturally I had to give it a go, so I went back to the greengrocer (he really is a lovely man) and got some cabbage. 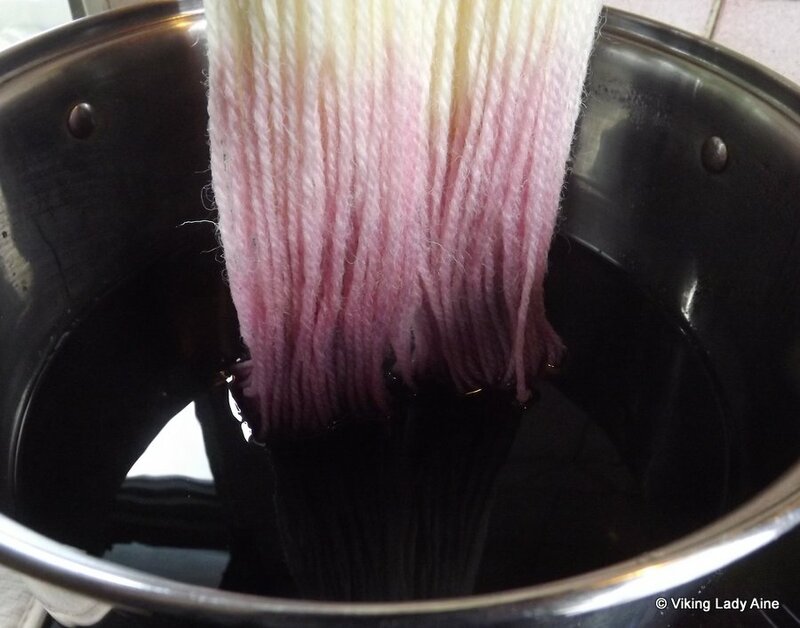 While I have no proof that the vikings would have used red cabbage as a dye stuff, it is another example of a colour which my be achieved from using natural dyes. 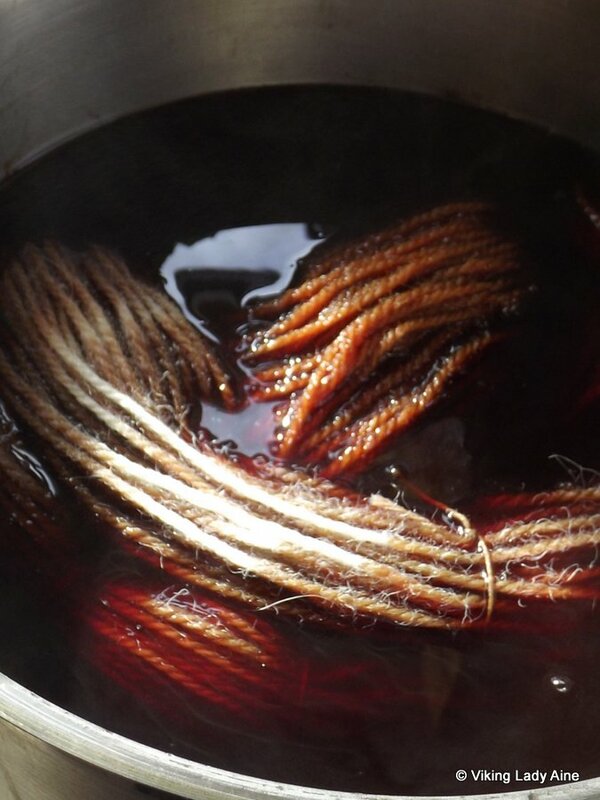 I used the same principle as the beetroot (twice the weight of dye material to the weight of wool), and the same method of preparing the dyebath. I used some wool that I had mordanted with alum before, and when I first added the wool I was quite hopeful of getting a pinky rose colour; it looked quite promising. 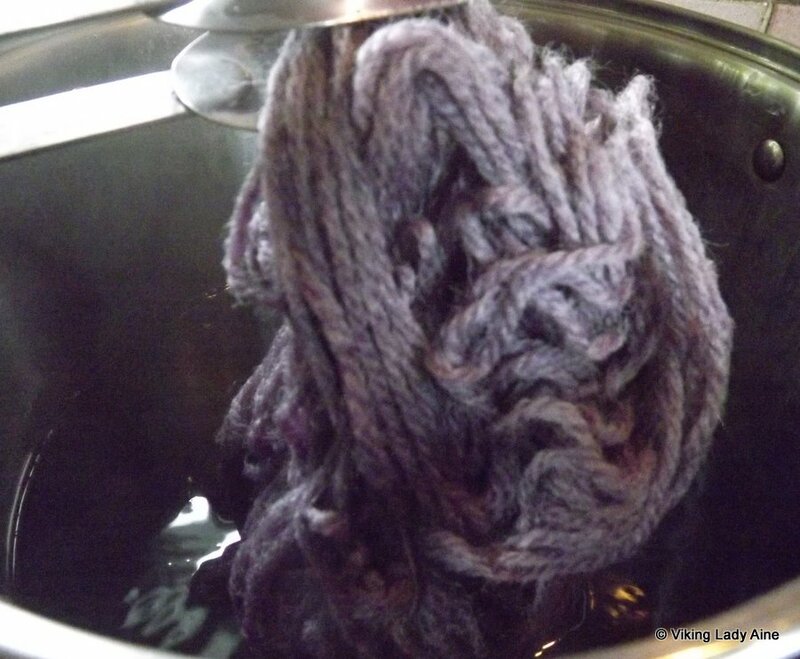 But one thing that natural dyeing has taught me is that things are seldom as they appear; after half an hour the wool had changed colour again…….. to a more slate blue. After simmering for an hour, washing and rinsing, here’s what I got…………….. blue! A very nice blue. It’s another good colour to add to the previous ones. 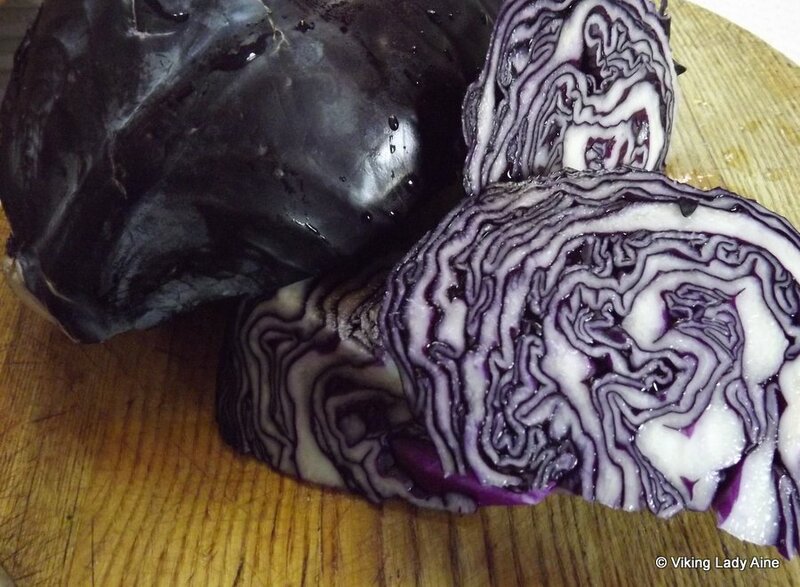 However I have been told that red cabbage is not completely light fast (and that it may fade in colour). I’ll just have to keep an eye on it and see if that’s true or not. Now, what else have I lying in my fridge? 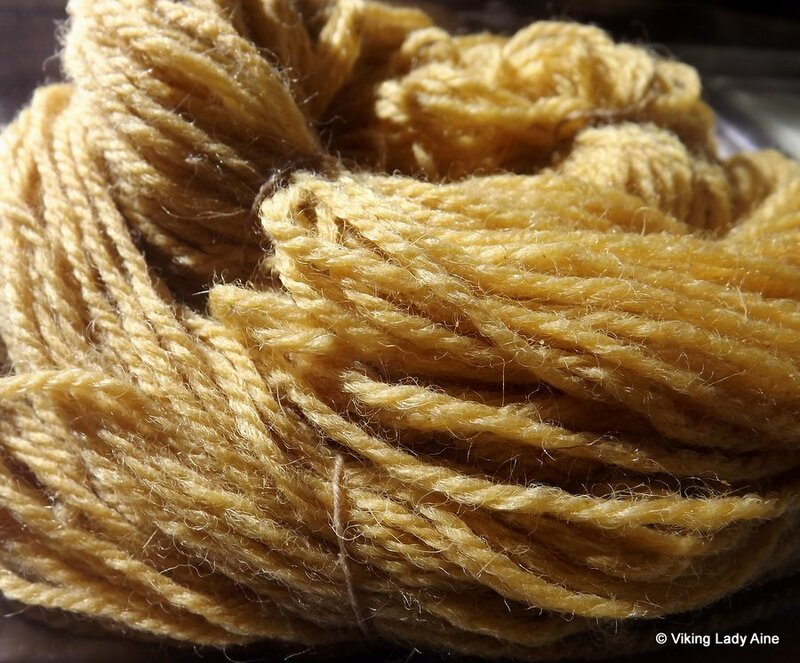 Posted on March 31, 2013 July 14, 2013 Categories Dying, Wool CraftTags Alum, Dye, Hand dyeing, instructions, looking at plants, Mordant, natural, natural dye recipes, natural dyeing, natural dyes, red cabbage, Viking, wool-craft, Yarn4 Comments on An unexpected blue!! 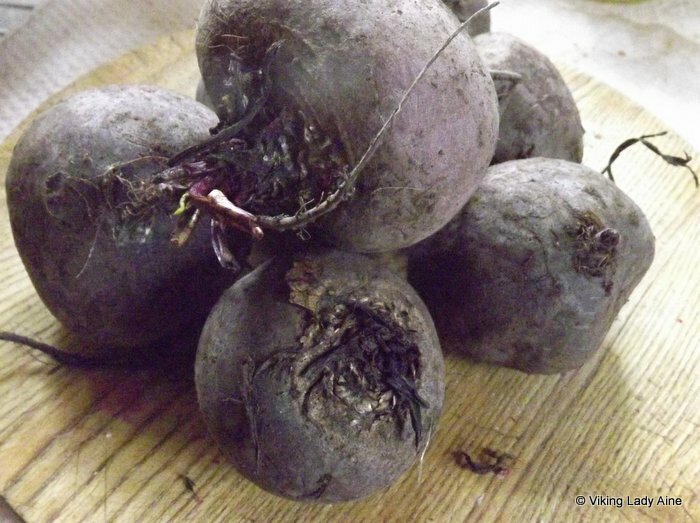 Beetroot……..not what you might expect! Beetroot stains………everything! It stains chopping boards, fingers, dishcloths and white cotton material a deep crimsony red. 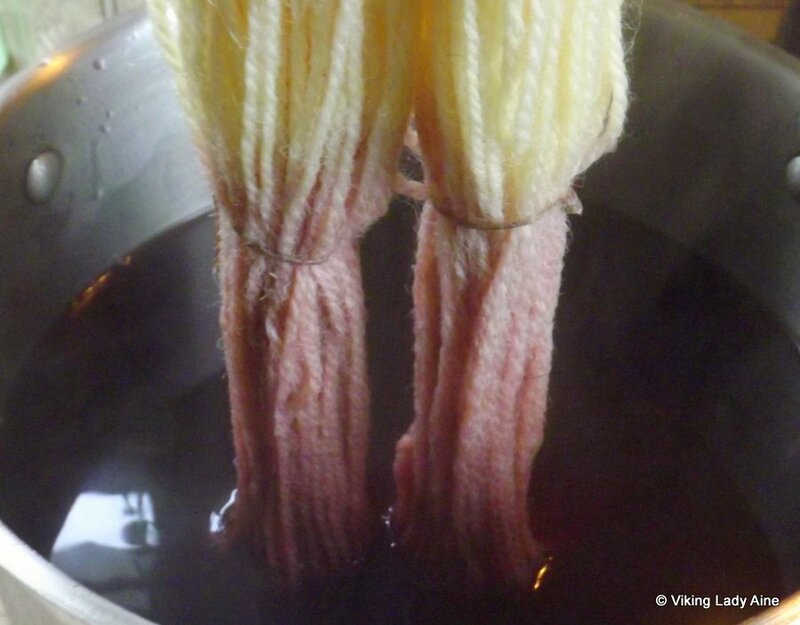 So as a natural dyer you’d be forgiven for thinking that you wouldd get that colour if you dyed wool with beetroot. Sorry guys – not gonna happen. I figured the best way to show this would be to dye some wool with beetroot and share my results. First thing to do was to get some beetroot, so I headed back to friendly greengrocer and bought some. 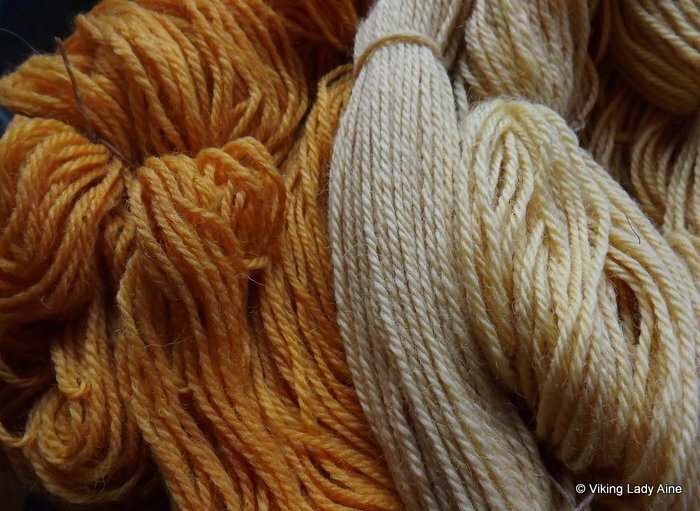 All the literature I had read suggested twice the weight of dye material to weight of wool. However I wasn’t feeling overly confident about this project, so I bought 900g beetroots to dye 300g of wool. After a quick wash, the wonderful colour was more apparent….. maybe it would work; after all my fingers were now red! 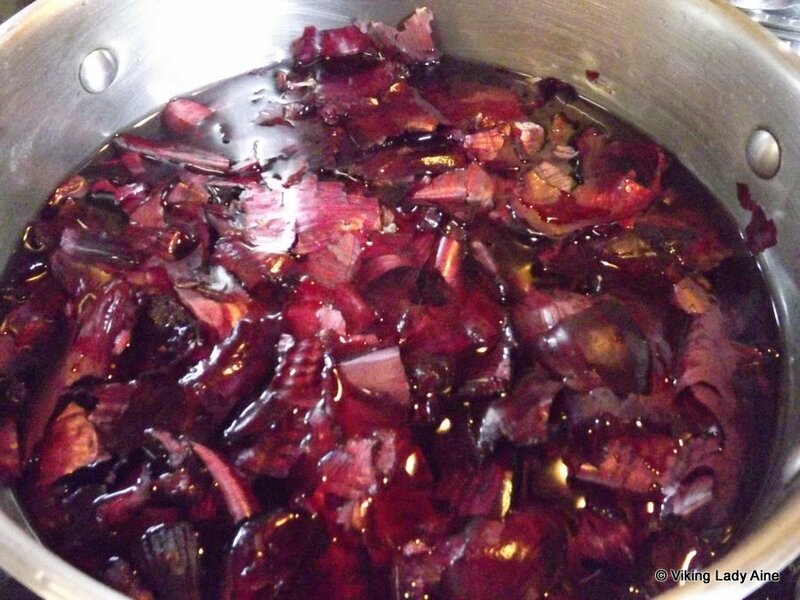 I chopped the beetroot up, covered with rain water and boiled for an hour. I use rainwater as it is more natural than the tap water in my area. 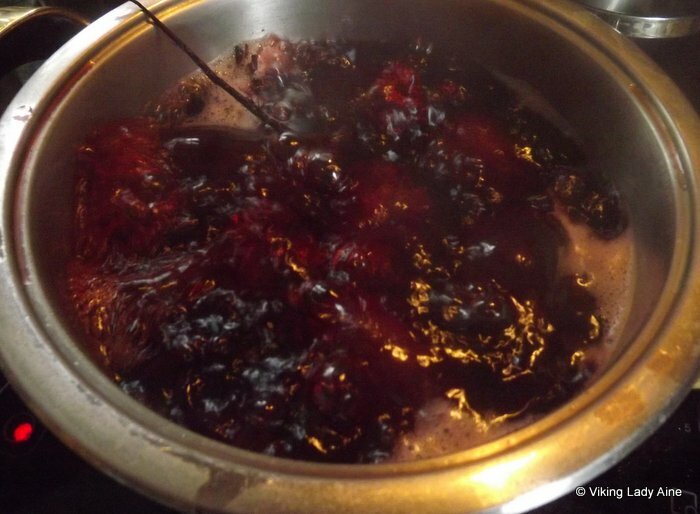 Then to extract as much dye as possible, I drained that off, re-covered the beetroot and repeated the process. In the pot the water had turn a wonderful shade of crimson. In a previous post about mordants, I had commented that some dye materials do not stick to the wool. Beetroot is one of these. So I decided to do a little experiment; dye one hank in the half the dye-bath with un-mordanted wool. It looked so promising, however as soon as I took the wool out of the pot the colour went; I now had a very pale beige colour. One thing I should point out is that the photographs are not exact replicas of the colours I’ve achieved, but they should give an indication of what happened. It’s a very pale beige colour. And there you have it; dye extracted from beetroot will not stick to wool that is not mordanted. But would a mordant make much, if any, difference? 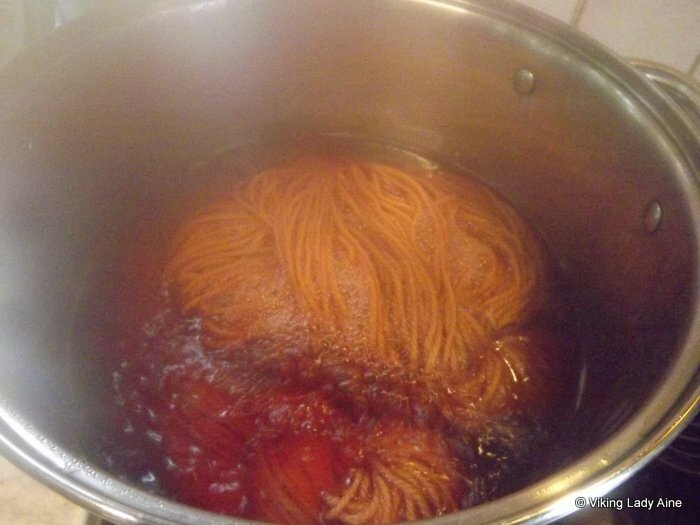 I’d already mordanted some wool and I added that to the dye-bath. Still no vivid red, but at this stage any colour would have been good; this looked more promising. 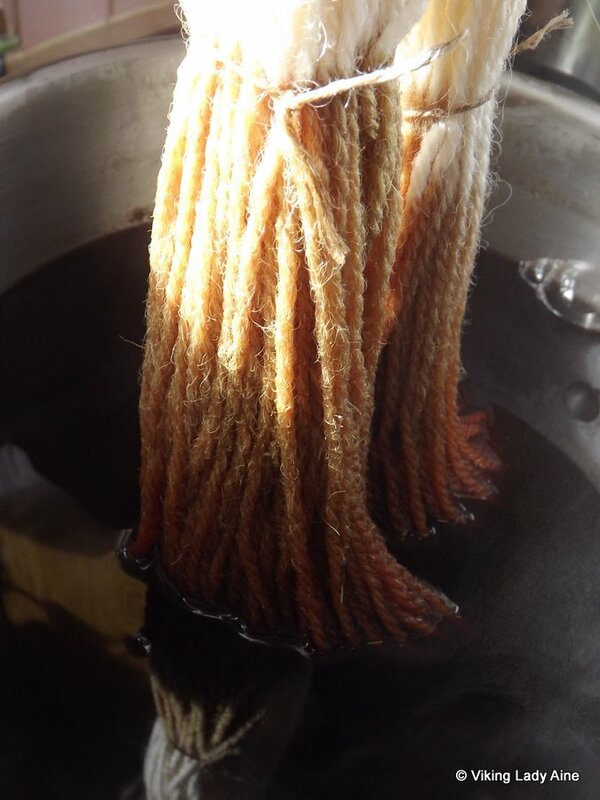 When I took the wool out of the pot, the colour held. Not the brilliant red one would expect from beetroot, but a soft peachy gold colour. 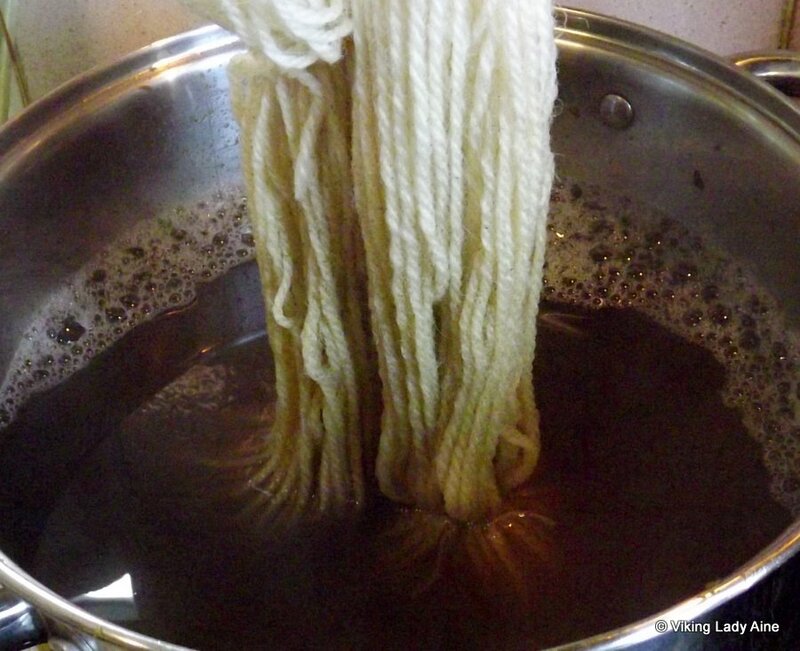 I left the wool simmering in the pot for an hour. I let the wool cool, then rinsed it through in cool water. 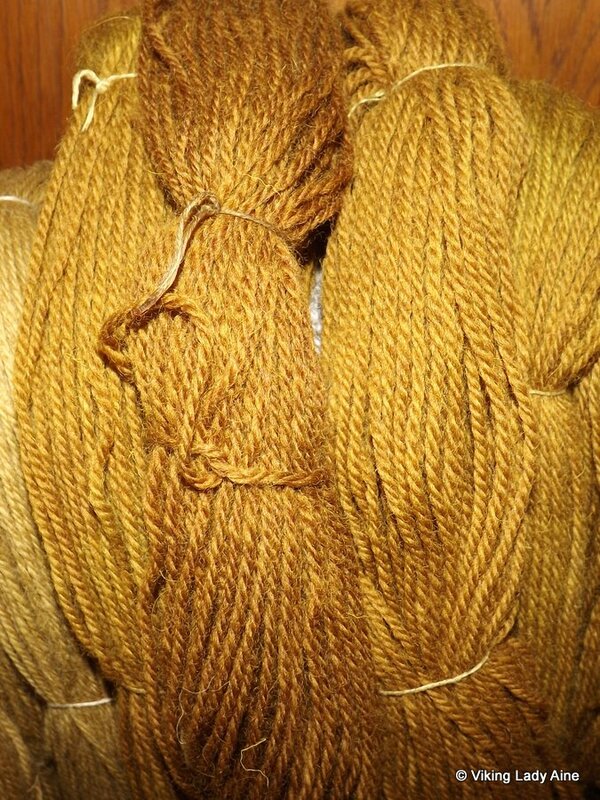 When i was finished I had two hanks of peach gold wool. They’re quite a nice colour actually. 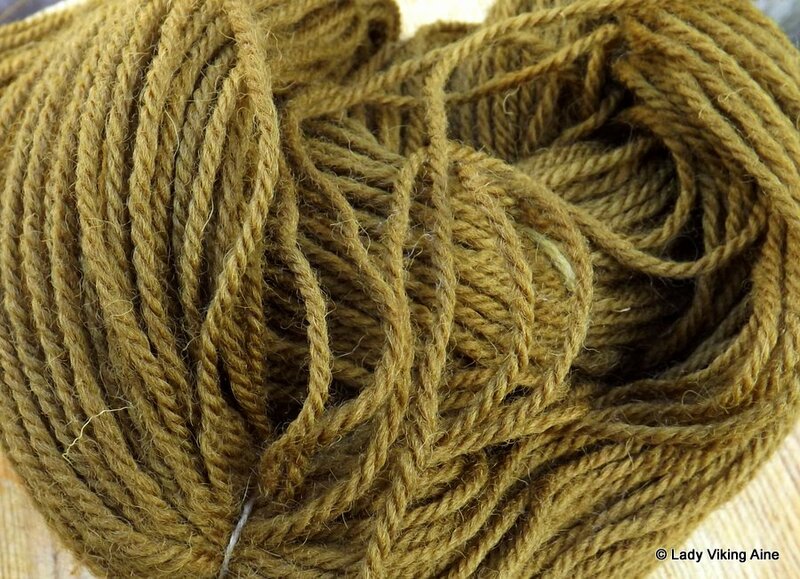 As a comparison, this is a photo of the mordanted and unmordanted wool together. 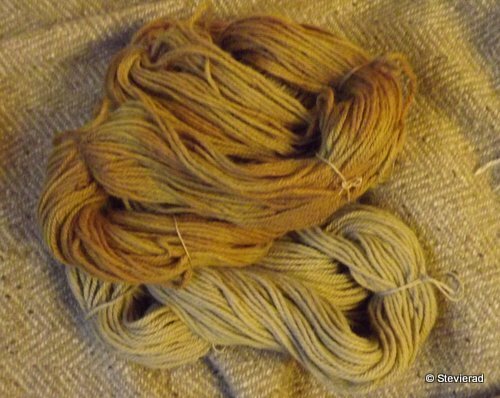 The colours in the photo are not as true to life as I’d like them, but I think they give an idea of the colours achieved and the need for a mordant if using beetroot as a dye-stuff. This was quite fun to do. 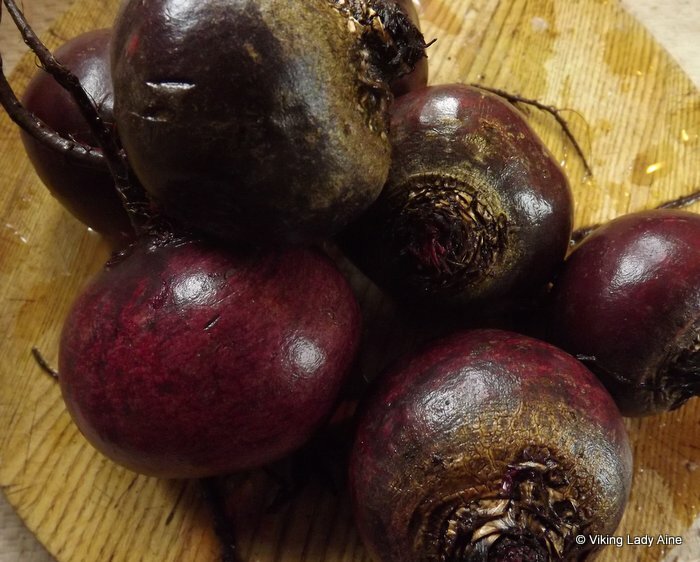 As a dye material, beetroot will not give you a vivid red (unfortunately) but it will give a rather nice peach gold colour. Would I use it again – yes! Posted on March 9, 2013 July 14, 2013 Categories Dying, Wool CraftTags Alum, Beetroot, craft, Dye, Hand dyeing, instructions, Mordant, mordanted wool, natural dye recipes, natural dyer, natural dyes, Viking, Wool, wool-craft, Yarn11 Comments on Beetroot……..not what you might expect! I was so pleased with my onion dyed hanks – I kept looking at them at thinking – Wow!! Next day I was going to get rid of the remaining dye but when I had a look in the bath, I thought there might be some dye left. I had some hanks I had previously dyed with lichen, moss and nettles, but the colours were quite muted. What would happen if I over-dyed them with the remains of the onion dye? This would be over-dyeing and exhaust dyeing in one go. Over-dyeing as I was putting colour over an existing colour, and exhaust dyeing as I was using up any remaining dye in the bath. So I thought I’d give it a go……. I soaked the previously dyed hanks in rain water (it’s still raining here!!) and in the meantime added a handful of onion skins to the dye-bath, brought it to the boil and simmered for another hour. 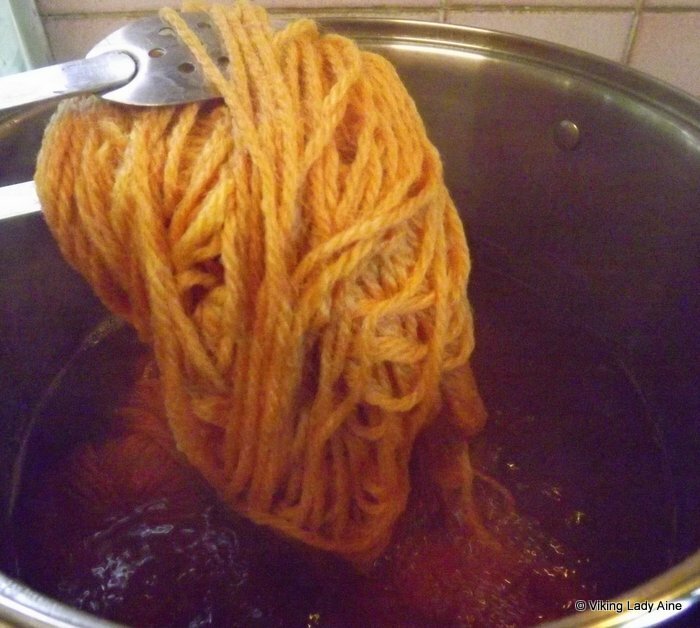 I drained the water off and I added the wool; I tied the hanks into knots to try get the ‘patchy’ affect – almost like tie-dyeing.I simmered the wool for an hour. 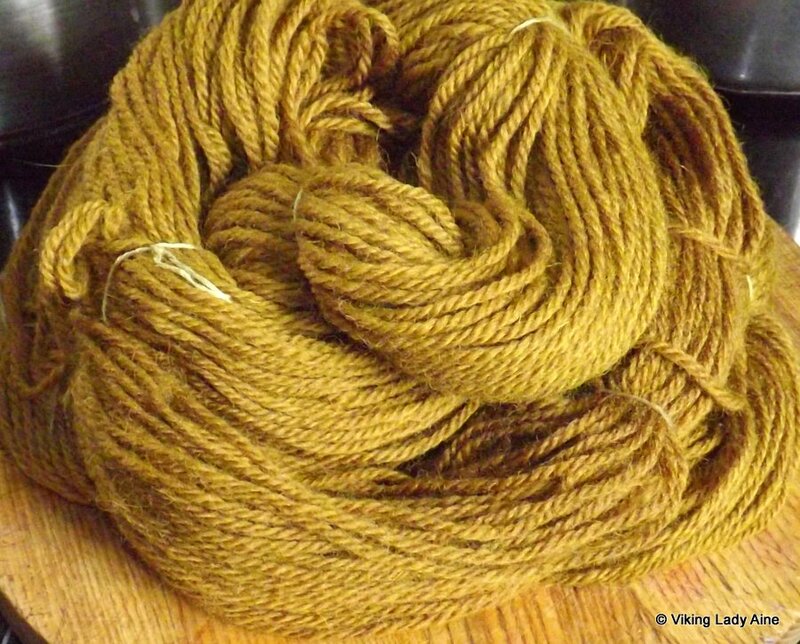 Originally this wool had been dyed with nettles. 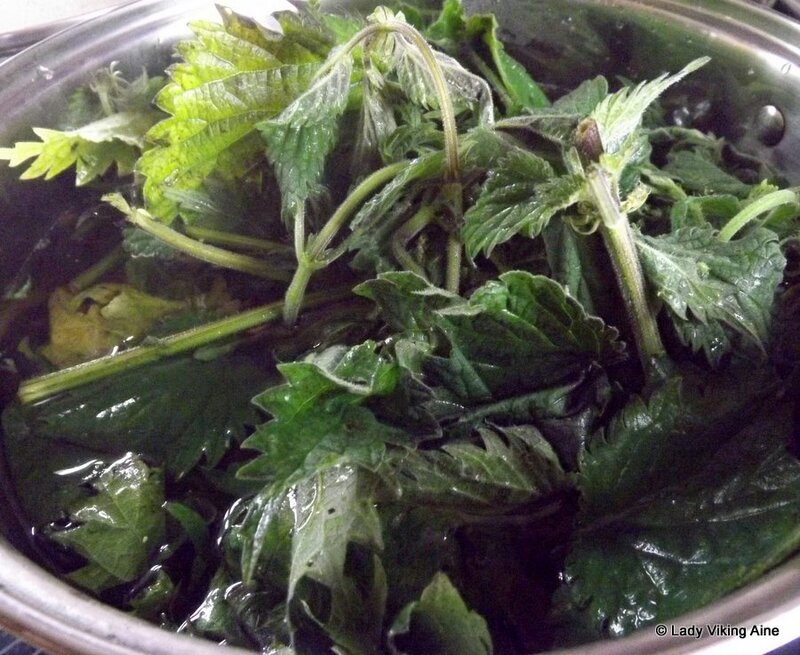 It was a very pale green, as it had been the last batch in a previous nettle dye. The pale wool at the bottom of the picture is the original. When I over dyed it I got an orange/green tie dyed effect. The next one had originally been dyed with lichen as an experiment. 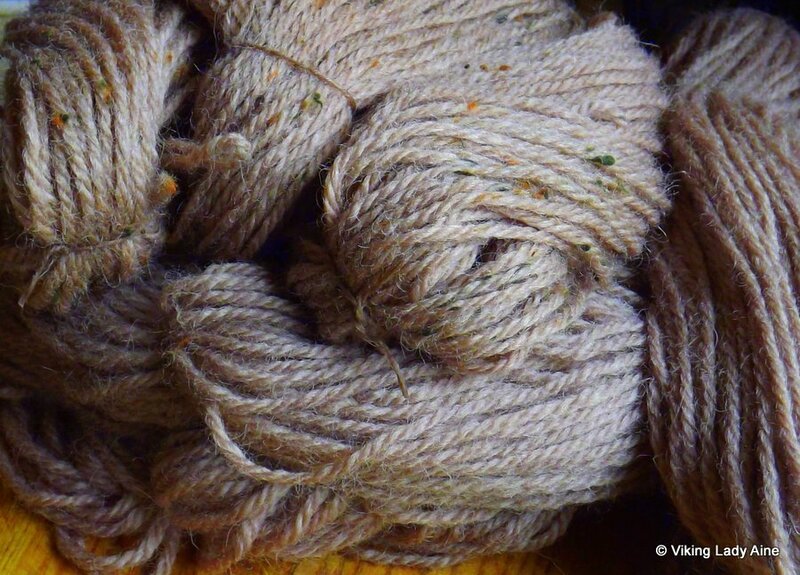 Unfortunately, in the lichen dyeing, the wool had taken up practically none of the dye, so the result from the over dyeing was a definite improvement. The last one had originally been dyed with garden moss. Again the original dyed wool is at the bottom of the photo; another pale pastel green. Over dyeing gave it a definite orange colour. I have to say I was quite pleased with the results. As there would have been some copper sulphate left in the dye-bath from the previous day, the colours were not overly bright, but they were good strong colours. 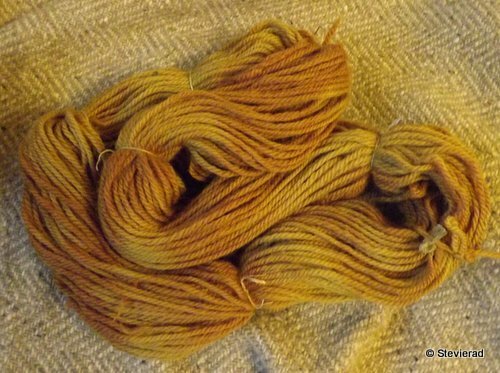 In previous exhaust dyeing with onion skins, I had gotten bright yellows from the last dye bath. The tie-dye effect creates a wonderful pattern in the wool when you make something with it. I love exhaust dyeing; it’s a great way to get the most from your dye bath. From the 140g of onion skins I originally used I got a whole range of beautiful colours! 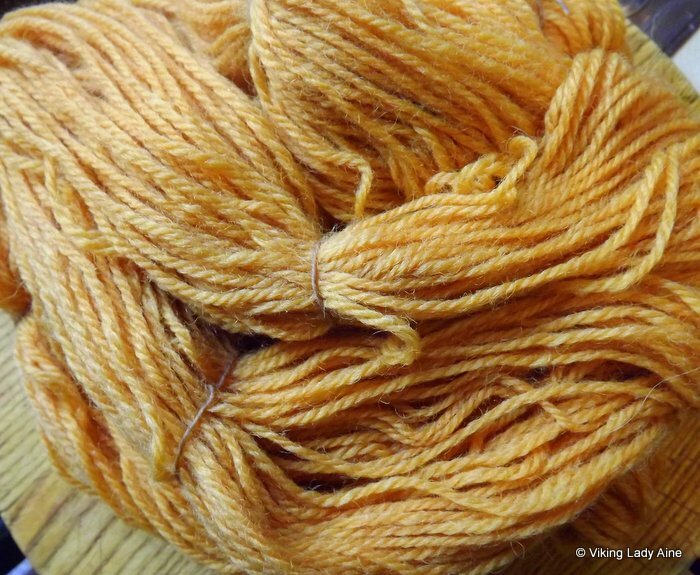 And over-dyeing is a way of using previous disappointing dyes and improving on them.